In Pointe Hébert, you can wake up and enjoy your morning coffee while overlooking one of the best views of Winnipeg’s skyline. With Esplanade Riel and the new Canadian Museum for Human Rights at your doorstep, many people are surprised to find such a stylish new housing development so close to all the action. 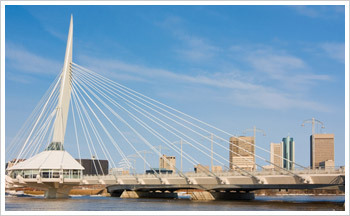 You can live in the centre of the city, surrounded by entertainment, culture and some of best dining Winnipeg has to offer – without the traffic and noise of downtown. To inquire about custom homes and lots in Pointe Hebert, click here. “The neighbourhood is perfect for a busy modern professional looking for a quiet space to live without the long commute to and from downtown. The excitement and action of the city is just over the bridge,” said Liam Milne, sales manager at Hearth Homes. A short walk will take you to The Forks Market’s charming boutiques, vintage shopping in the historical Exchange District, and Winnipeg’s dining jewels along Waterfront Drive. Staying in St. Boniface will keep you rich with the culture, cafés and restaurants that line Provencher Boulevard. In February, you’ll have the Festival du Voyageur at your front door, bringing together the community for a celebration of French heritage. “A combination of area and neighbourhood that would rival the likes of Vancouver’s Commercial Drive or Montreal’s The Plateau. These new areas often emerge and grab the city’s needs for change. 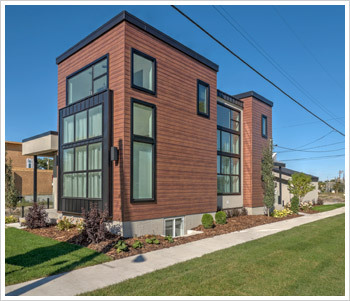 We have seen this in Pointe Hébert and this change is what keeps the neighbourhood interesting and thriving,” said Dan Rolfe, project manager of Maric Homes. Maric designed the 2014 HSC Lottery show home, which sits right in the centre of the neighbourhood and acts as a strong example of the builder’s ability to craft a unique and modern home that fits in with the history of the area. Nestled off Taché Avenue is the historical St. Boniface French Quarter, you’ll find French country inspiration in Pointe Hébert, mixed with a clean and contemporary flair. 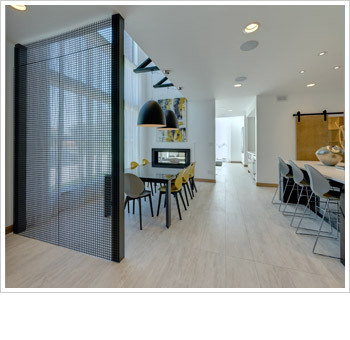 Each home is custom-built for your own practical and aesthetic tastes to express the individuality of the people who live inside. Life can be busy, and a well-designed home can help make all the difference. For example, a beautiful breezeway attaching your home to the rear garage doubles as a means to stay dry when rain or snow fall. “Our Pointe Hébert homes have a modern sleek layout, built to maximize space with low-maintenance products and materials to ensure long-lasting comfort. They’re perfect for anyone who wants a beautiful family retreat close to both downtown and the heritage of St. Boniface,” said Domenica Vasallo, controller at KDR Homes.